Description: What is the relationship between the strength of a country's democracy and the ability of its courts to address deficiencies in the electoral process? 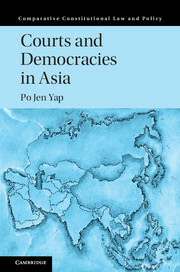 Drawing a distinction between democracies that can be characterised as 'dominant-party' (for example Singapore, Malaysia, and Hong Kong), 'dynamic' (for example India, South Korea, and Taiwan), and 'fragile' (for example Thailand, Pakistan, and Bangladesh), this book explores how democracy sustains and is sustained by the exercise of judicial power. In dominant-party systems, courts can only pursue 'dialogic' pathways to constrain the government's authoritarian tendencies. On the other hand, in dynamic democracies, courts can more successfully innovate and make systemic changes to the electoral system. Finally, in fragile democracies, where a country regularly oscillates between martial law and civilian rule, their courts tend to consistently overreach, and this often facilitates or precipitates a hostile take-over by the armed forces, and lead to the demise of the rule of law.